Jewelry and other hand-carved designs are among several items being sold at the Winter Gift Market at the American River College Student Center until 7 p.m. on Thursday. Vendors invited by the Center for Leadership and Development had the chance to showcase and sell their items to students and faculty. “You’re hoping all students, staff and faculty members can co-mingle when they’re shopping, it’s like a party with laughing, talking and shopping,” said Student Personnel Assistant Frankie Johnson on the experience that she hoped people would have shopping at the event. The purpose of the event is to show that buying a Christmas gift does not have to be an expensive item and that a cherished present has a distinctive quality over the quantity spent during the holidays. Jim Dellaria, a jewelry maker said he has made jewelry for 30 years. Dellaria had said that the process to put together one of his octopus rings took several days to complete. “Two days to set it all up, a day to pour it, two days to finish it,” said Dellaria. Dellaria added that his son Lance is a ‘caster’ who had been doing work with his father since he was a young boy. “He’s been doing shows since he was a baby,” said Dellaria. Kingston Yee, another jeweler, started selling his work at ARC 11 years ago, and began four years before becoming a vendor at ARC. 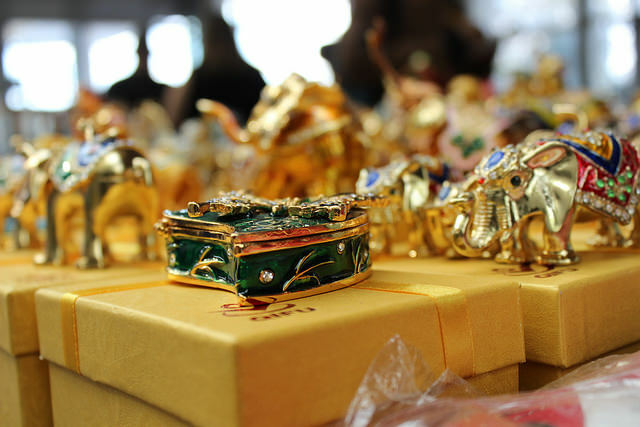 “I started back 15 years when friends brought back jewelry trinkets from overseas,” said Yee. ARC students Morgan Massey and Kori Riffle attended, where Massey had an admiration for a jewelry stall due to her personal taste. Riffle had added that the items could be a great idea for a Christmas gift. “These are good gifts all around here,” said Riffle. The sale concludes Thursday with items such as hats, bracelets, purses, nail polish, scented oils still being sold. Be the first to comment on "Winter Sale at ARC offers gift ideas for Christmas"